ForexNewsNow – GFT Markets is a leading online trading market maker and technology provider. The company became known for its competitive spreads and great executions times which are aided by the revolutionary DealBook online trading platform. GFT has just announced that it had developed and released a new mobile trading app for Android devices based on the DealBook online trading platform. This will enable online traders to access the services provided by GFT Markets from anywhere where an internet connection is available. The new mobile app based on the DealBook platform just went live a few days ago offering traders the possibility to access the large selection of GFT Market’s services right from their smartphones. This will be a huge advantage to traders who used to travel a lot without any laptops or notebooks. 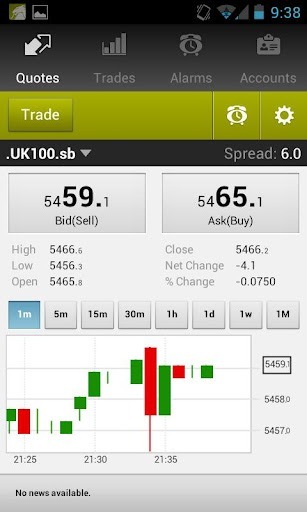 The new app is sleek and elegant offering traders a great overview about all the aspect of the trading platform. This aspect of the app is extremely useful due to the fact that GFT Markets is known to be offering a large number of trading possibilities that might become hard to find if the platform would not be extremely user friendly. 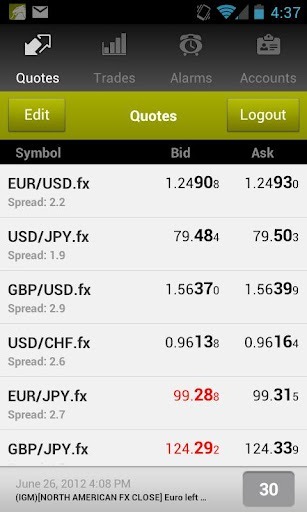 The app gives access to all the 120+ currency pairs offered for forex trading in the DealBook client. Likewise traders will have access to 3200+ markets as CFD or spread betting. At this moment a very limited number of brokers and mobile apps offer such a sophisticated selection of assets and trading possibilities. Another huge advantage of the new app is the option to generate customized charts that reveal a lot of useful information that traders will be able to use in their advantage. Most other forex trading apps of this kind are limited to generic and pre-made charts only but the GFT Markets DealBook mobile app allows traders to create completely unique graphs based on their trading habits and preferences. 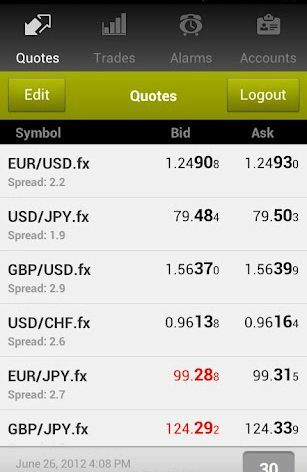 GFT is a premier online broker mostly specialized on forex trading. The venture is a true market maker providing clients with very competitive spread bets as well as advantageous execution times. The venture is operating in more than 120 countries and has offices in a large number of jurisdictions. The company has developed an in-house online trading platform which is called DealBook. DealBook allows online traders to quickly access their trading accounts and choose the best trading options available. The DealBook platform is extremely easy to use and was specially designed in order to fulfill the needs to both starters and experienced traders. Despite the many options and features available in this platform, due to the very user friendly and elegant interface, new traders will have a very easy time in learning every aspect of the services provided. The strongest segment of the company is the forex trading part but traders will be able to profit from services involving CFDs, binary options, FX options and spread bets. The company behind the broker is a reputable venture with the main headquarters in the United States.